Launch Alliance Atlas V rocket blasts off from Space Launch Complex-41 carrying the fourth Global Positioning System (GPS) IIF-4 satellite for the U.S. Air Force from Space Launch Complex-41.This is the fourth ULA launch this year and marks the 70th launch success in the 77 months since ULA was formed. An Atlas 5 rocket successfully powered a replacement Global Positioning System satellite into space Wednesday to bolster the navigation utility for military and civil users around the world. The 737,000-pound, two-stage rocket, loaded with kerosene fuel, liquid oxygen and liquid hydrogen, roared to life at 5:38 p.m. EDT (2138 GMT) to launch the GPS 2F-4 spacecraft, continuing a string of on-time launches of all four Atlas rocket flights so far this year. The RD-180 main engine produced nearly 860,000 pounds of thrust to propel the rocket on a pillar of intense fire, reaching the speed of sound in 78 seconds and pushing through the region of maximum aerodynamic stresses at 91 seconds. The flight path headed on a 45-degree azimuth from the launch pad, a northeasterly trajectory to cross the Atlantic en route to rendezvous with the GPS satellite network 11,000 nautical miles above the planet. Four minutes into the flight, the first stage was shed and the venerable Centaur upper stage assumed control to deliver the 3,400-pound satellite into the proper orbit via two burns. As the cryogenic RL10 engine got started, the 14-foot-diameter nose cone shrouding the payload for the trek through the atmosphere separated to unveil the GPS satellite to space. Traveling up the eastern seaboard and then across the North Atlantic, the Centaur injected itself into a highly elliptical transfer orbit with a high point at the GPS operational altitude and a low point at just 90 miles. As the engine fell silent 17 minutes after launch, the rocket entered a three-hour coast to climb in its preliminary orbit to the high mark achieved by the first burn. A second firing of the RL10 powerplant, lasting about 90 seconds, was performed south of Australia to bring the low point up to the constellation's height. At 9:02 p.m. EDT, three hours and 24 minutes after leaving the launch pad, the GPS 2F-4 spacecraft was released from the rocket for its mission to beam navigation information to users around the globe through its upgraded capabilities. "The Air Force is working hard to advance the GPS network for improved accuracy across the board for things like commercial aviation signals, anti-jammers and a long service life as we evolve the system over time," said Lt. Col. Paul Konyha, commander of the 45th Launch Support Squadron at the Cape. Once checked out and activated as the 31st GPS satellite currently operational in the constellation later this summer, the $121.3 million spacecraft will become the fourth member with the latest enhancements to increase accuracy and security to populate the network since 2010. "From a military standpoint, clearly it is hugely important that GPS is able to provide precision, day or night, all-weather guidance and timing to numerous platforms and weapons that we have. GPS is critical to how we fight wars on land, sea and air. Space systems truly are an embedded part of how the U.S. military operates these days," said Col. Steve Steiner, chief of the GPS Space Systems Division at the Los Angeles Air Force Base. The continuous navigation signals emitted by GPS satellites allow users to find their position in latitude, longitude and altitude and measure time. A GPS user receiver measures the time delay for the signal to reach the receiver, which is the direct measure of the apparent range to the satellite. Measurements collected simultaneously from four satellites are processed to solve for the three dimensions of position, velocity and time. Users can determine their location to within feet, speed within a fraction of a mile per hour and time to within a millionth of a second. "The timing capabilities of the vehicle are also integral to the U.S. economy," said Jan Heide, Boeing's GPS 2F program director. "Every ATM transaction that happens essentially is facilitated by GPS timing capabilities." Wednesday's launch window and the rocket's northeasterly trajectory put the satellite on course to enter the C-plane of the constellation where this spacecraft will replace an aging GPS bird deployed in 1996. Having twice surpassed its seven-year design life, the GPS 2A-25 satellite was launched by a Delta 2 rocket on March 27, 1996 and entered service on April 9. But it will relinquish the Plane C, Slot 2 position in the constellation when the new GPS 2F-4 goes into service later this summer. The GPS 2A-25 satellite will slide into a backup role within the C-plane for the remainder of its useful life before retirement, Air Force officials said. "It's old but it's not the oldest," Steiner said. "Age alone is not the determining factor (of which craft to replace) because some satellites will lose redundancy, for instance, on a subsystem at a younger age than an older one. So really it is based on how well the individual subsystems in all are working with any given satellite." The constellation is comprised of six orbital groupings, or planes, that circle the planet at a tilt of 55 degrees inclination relative to the equator, allowing their paths to cover most of the populated globe. There are 30 operational satellites today, including 8 GPS 2A, 12 GPS 2R, 7 GPS 2R-M and three GPS 2F spacecraft. "2F satellites are critical to sustaining and modernizing GPS for the years to come," Steiner said. "GPS 2F satellites represent part of our overall modernization in GPS, inducing improved signals, enhancing our position, navigation and timing services that support not only our warfighters but growing civil and commercial needs of the U.S. and global economy." Boeing is building 12 of this GPS satellite generation, with eight more to deploy starting with 2F-5 this October and 2F-6 next May. Three of the craft are complete and in storage, the other five remain in construction that will be finished in the next several months. "We are on track for completing all of the production efforts by the end of this year," Heide said. "The first three of our GPS 2F satellites are currently on-orbit and meeting all of our mission requirements. The mix of 2A, 2R and 2R-M satellites, along with those three 2Fs in constellation continue to perform exceptionally well," Steiner said. 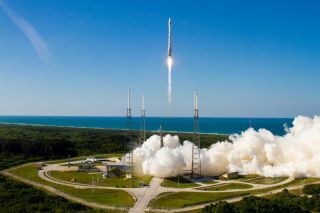 Wednesday marked the first time an Atlas rocket had launched a GPS satellite since the original batch of developmental craft between 1978 and 1985. The next is expected in the summer of 2014. For the Atlas 5 rocket fleet, Wednesday was the fifth launch since December and 9th in the past 12 months. Next up will be deployment of the Navy's second MUOS mobile communications satellite on July 19 during a window of 8:51 to 9:35 a.m. EDT. And Wednesday marked United Launch Alliance's 70th flight since its creation 77 months ago. A Delta 4 rocket will make it 71 launches when it carries the military's WGS 5 communications satellite into orbit next Wednesday night from the Cape.